Four different cooperative tile games. 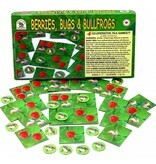 Players form as many good Berry Patches as they can, with the help of the friendly Bullfrogs. The basic mathematical skills of adding, subtracting, multipying and dividing all get a workout. 1 to 12 Players, Ages 4 to 7 Six tiles have only Berries on them. Six have only Bugs. Eight have both Berries and Bugs. The Bug shown is a Slug, one of the few insects that damage Strawberries. Each of the 12 Bullfrogs can eat one bug. In THE GOOD BERRY PATCH GAME, players form as many Good Berry Patches as they can that have more Berries than Bugs. 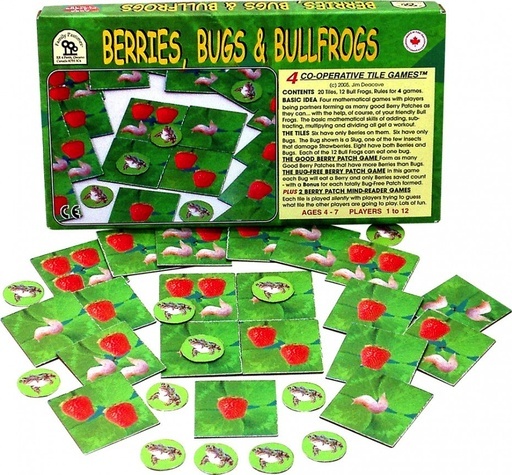 In THE BUG-FREE BERRY PATCH GAME, each Bug will eat a Berry and only saved Berries count… with a Bonus for each totally Bug-Free Patch formed. There are also two MIND-READER BERRY PATCH GAMES, in which each tile is played silently with players trying to guess what tile the others are going to play. Lots of fun. Includes: 20 tiles, 12 bullfrogs, rules for 4 games.